Have you been considering doing a few exterior updates to your home such as new siding or windows? If so, you’ve likely investigated some of the contractors in the area. Before you sign a contract with another contractor, the team at Refuge Roofing & Siding wants to introduce ourselves to you and your family. 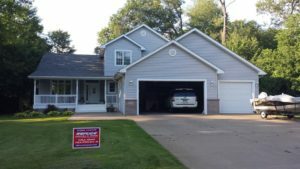 At Refuge Roofing & Siding, we’ve been one of Minnesota’s top residential & commercial exterior contractors for many years. Our team specializes in utilizing the latest high quality siding and replacement windows to ensure your home will not only look great, but will also be more energy efficient than ever before. Technology has improved dramatically in the siding and window industry and at Refuge Roofing, we’re always happy to show our customers how they can actually save money by investing in replacement siding and windows for their home. Vinyl Siding – With maintenance free vinyl siding, you can choose a siding material that requires no painting, sealing or caulking and will last for many years to come. LP SmartSide – These products give you all the benefits and beauty of wood, but none of the maintenance concerns. LP SmartSide is extremely durable and offers a 50 year limited warranty. Steel Siding – Offers even more protection than vinyl because it can withstand severe weather while still being mostly maintenance free. Cedar Siding – If you’re looking for a more natural look, it’s hard to go wrong with cedar siding. But if you do choose this type of siding, it’s critical that you choose a reputable and skilled cedar siding contractor to properly install this product. Keep in mind that cedar siding requires painting or sealing every 3-5 years. Vinyl/Polymer Shake Siding – Vinyl or polymer shake siding gives you a similar look to cedar shakes, but is virtually maintenance free. This makes it a great option for those individuals who are looking for the appearance of cedar without the significant maintenance. At Refuge Roofing & Siding, we install both Mastic and Anderson windows depending on your needs. Both of these manufacturers make extremely high quality replacement windows that work well in our area. These windows are also extremely energy efficient, low maintenance and easy to clean. Feel free to reach out to the Refuge Roofing & Siding team today to setup a free consultation to take a look at your current siding and windows to determine what’s needed. We’ll be completely upfront with our suggestions and will never pressure you into making a decision. Reach out to us today at 651-PRO-ROOF to get the ball rolling!